The Dutch and Portuguese Fort was created in 1672 and was later destroyed by the British. 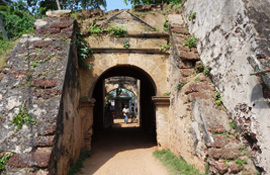 Today the fort itself is largely in ruin, but the gate with its date of construction inscribed on it is still visible. A bicycle ride on the path along the canal is a good way to see many of these colonial constructions. Near the Negombo lagoon you'll come across an unusual wetland environment that contains the country's largest marsh. 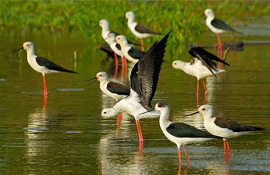 It's popular with eco-tourists as its habitat provides a comprehensive view of the wildlife and plant life indigenous to Sri Lanka's coastal wetlands. The canal was at one time an important link in the transportation route which supplied the Dutch colonial administration. It runs for more than 60 miles. Today it's an attraction for tourists and one of the more interesting ways to see the town and the surrounding area. 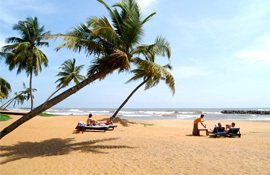 Negombo is a year-round destination boasting lovely golden sandy beaches, a recently restored old quarter and a charming old world fishing village atmosphere. An excellent diving spot where you can see stunning corals, groupers and all sorts of colourful fish. 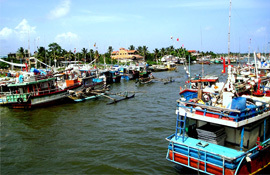 The Negombo Fish Market is the second largest fish market in the Island. 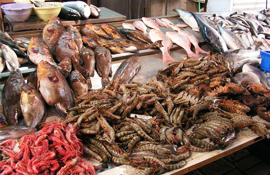 Many visitors to the city do not forget to visit the fish market even for once. On the other hand, a high number of people reach here for seeing, purchasing, and selling the fishes. It is amazing to see such a large heap of fishes in many varieties gathered at one place like people see at Negombo Fish Auction. 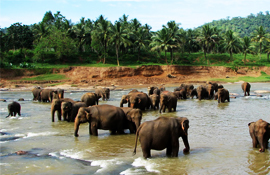 Pinnawela Elephant Orphanage has become one of the most popular tourist attractions in the country. Kids will enjoy watching and taking photos of the baby elephants as they play and bathe in the river. Pinnawela is about an hour's drive from Negombo. The main attraction is clearly to observe the bathing elephants from the tall river bank as it allows visitors to observe the herd interacting socially, bathing and playing. Lewis Place Beach Front, Negombo, Sri Lanka.